This litter was whelped on December 20, 2018, the dam Mya is a beautiful chocolate, 80 lbs. Mya is a pointing lab, her mother was one half Kellogg from South Dakota. She has her AKC Junior Hunter title, she is a strong pointer, and loves birds. 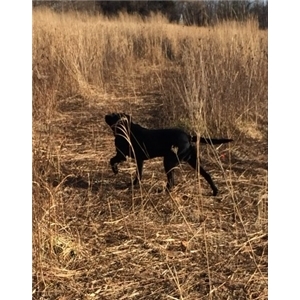 This is a repeat breeding and the reviews from the hunters who have purchased her pups goes and I quote, "The smartest and best hunting dog I ever owned". 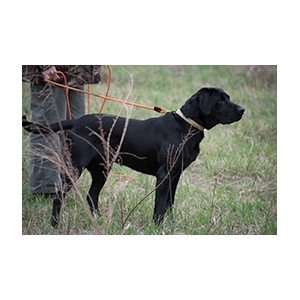 The sire also owned by us is Lt. Dan, he is a large (95 lb) black lab, he was purchased from Hunters Point Kennel in Iowa, his father is 4xGMPR HRCH Clouds Bold Bear of Nereus SH whose blood line includes two U.S. Open Pheasant Champions. Dan also has his AKC Junior Hunter title. 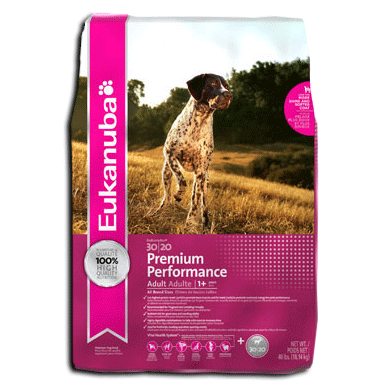 Dan is also a very strong pointer and has a very strong drive in the field. Both Mya and Dan have exhibited excellent marking ability in retrieving. Both Mya and Dan are also our companions with classic "lab" dispositions. Both have OFA certified hips "Good", Elbows "Normal" and are EIC tested clear. I give a 26 month health guaranty, they have their dew claws removed, will have their first two shots, and wormed. All the pups are checked by a vet for soundness. This litter has blacks and yellows.